Extreme Torque 14-Pc. 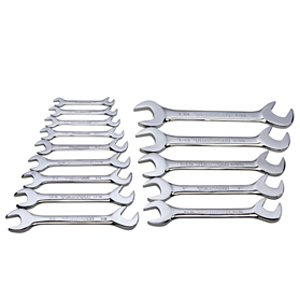 Angle Open End SAE Wrench Set features drop-forged, heat treated high carbon steel with a polished, corrosion-resistant, triple chrome-plated finish. Precision machined 15-degree and 60-degree angled heads get a sure, firm grip on nuts and bolts in confined places making turning easier than with conventional wrenches. This set comes in a heavy-duty, roll-up storage pouch. ETC wrenches have a lifetime warranty and replacements are available individually. 14-pc. wrench set sizes (Inch): 3/8, 7/16, 1/2, 9/16, 5/8, 11/16, 3/4, 13/16, 7/8, 15/16, 1, 1-1/16, 1-1/8, 1-1/4"